What happened to Ben-Gurion’s Oasis in the Desert? Upon reading Mark Levine’s response to Jon Voigt’s open letter, I thought about why many people like think as Jon Voigt does, and how political trends in Israel make his views rather quaint. There is a lot to admire in the words, and many of the deeds, of Israeli leaders in the early years. Mapai/Labor were in charge and the kibbutz movement was ascendant. Ben-Gurion’s oft-quoted dream of making the “Negev desert bloom” is what people are thinking of when they see Israel as a project to create an oasis in the desert. The residual goodwill from that period are part of the reason an earlier generation sees the whole period with rose colored glasses and that is where Voigt is coming from (and Woody Allen as well). Ben-Gurion’s powerful image of the desert oasis suggested a barren, sparsely populated land. This is part of the reason so many people still believe that all of Palestine was populated by nomadic tribes prior to 1948. This may have been true about the Negev Bedouin, but even they alone were over a 100,000 in 1948. In comparison, the entire Jewish population in then Palestine was around 600,000. It is a dreadful thing to see the dead city. Next to the port I found children, women, the old, waiting for a way to leave. I entered the houses, there were houses where the coffee and pita bread were left on the table, and I could not avoid [thinking] that this, indeed, had been the picture in many Jewish towns [i.e., in Europe, during World War II]‘. To come back to the desert though. The Negev Bedouin had a way of life which deserves respect. They had lived and survived on that unforgiving land for centuries. After 1948, they were forced into settlements, and thousands expelled into Jordan or Egypt. This has diminished their culture (not to mention dispossessed them of their lands). So even that ostensibly inoffensive project is more questionable than many claim. In some ways, the treatment of the Bedouin parallels our own country’s treatment of the Native American tribes living on the Great Plains. In 1948, the Allied Powers attempted to atone for their inability to prevent the holocaust and their own abject failure to take in Jewish refugees during WW-2. They did this by handing over Palestinian lands via the UN to the Jewish population of Palestine. Land that was not theirs to give. No Western country had accepted Jewish refugees in large numbers prior to and even during the war. Hitler had said in 1938 that he would aid emigration of Jews to other countries. None except the Dominican Republic took him up on the offer and a potential opportunity was lost. With a cynic’s glasses, the partition of Palestine and support for Zionism can be seen as an attempt by the Allied powers to avoid dealing with vast numbers of refugees and survivors by placing them in Palestine. The partition of the Homeland is illegal. It will never be recognized. The signature by institutions and individuals of the partition agreement is invalid. It will not bind the Jewish people. Jerusalem was and will forever be our capital. Eretz Israel will be restored to the people of Israel. All of it. And for ever. Palestinians did not accept the partition plan. They put forward two reasons. The first was their right to self-determination and a desire to set up their own institutions after the British mandate over Palestine ended. They did not believe their right to self-determination could be surrendered to the UN and Allied Powers. The second is rather clear, a large portion of their land was being given away to the Jewish state. Palestinians Christians and Muslims owned over 90% of the land, now they would end up with less than half. Why would any people acquiesce to such terms except under threat of force? That threat, and actual force was soon deployed by the nascent Israeli Defense Forces and other Jewish militia. The Palestinians had not formed militia and were quickly overrun. As Muslim and Christian Palestinians were 70% of Palestine’s population, any government in undivided Palestine would have led to a state with a significant Jewish minority. That could be remedied with an influx of Jewish refugees, but a majority Palestinian state was unlikely to accept vast numbers of Jewish refugees. The aftermath of WW-2 was a rather dangerous time. The Iron curtain began to descend and the Ottoman and British empires disintegrated definitively. In the Middle-East, Egypt, Syria, Iraq, Jordan and Israel itself coveted Jerusalem and the rest of Palestine. It is difficult to fault the Jewish survivors of the holocaust for thinking true security for the Jewish people would come only once they had a land of their own. Lest we forget, even the US was not a particularly welcoming environment for Jewish communities and individuals in the 1940s. Jews in the US endured discrimination into the 80s and in some places that is true even today . The Irgun militia, led by Menachim Begin, was responsible for the 1946 bombing of the King David Hotel which killed 91, including 28 British citizens . They were labelled a terrorist organization by Great Britian and the Jewish Authority in Palestine. The Irgun were also responsible for the massacre of perhaps 300 Palestinians in Deir Yassin, an episode that spread panic throughout the Palestinian population. In comparison, there were just over 800 fatalities from Palestinian suicide bombings in the 1990s and 2000s. Though the broader Israeli militia condemned the massacres, they did not hesitate to take advantage of the panic, and created quite a bit of it on their own by distributing printed warnings, expelling Palestinian Muslims and Christians, killing many individuals and razing numerous homes. Palestinian homes were reassigned to Jewish residents. The nascent Israeli state did handle the most radical elements of the far-right with firmness. When push came to shove, Ben-Gurion had the IDF fire on Begin’s Irgun militia. Admittedly, this was to keep them from landing a ship full of heavy armaments, and to prevent them from creating an “army within an army”. Throughout the rest of his life, Ben-Gurion did his utmost to marginalize Begin and his radicalism. Even if you disagree with their methods and ends, what the first generation of (somewhat secular and left-leaning) Israeli leaders were able to achieve is truly astounding. From a population that had been persecuted across the length and breadth of Europe and had lost six million of their number to Nazi murder, they built a nation . We may fault them for sowing and then taking advantage of panic among the Palestinian population. We may also admit they had no just claim to the Palestinian lands they took by force and decree, but we must recognize the achievement and give a little credence to their rationale. Menachem Begin, Ariel Sharon, Benjamin Netanyahu are at the opposite political spectrum from David Ben-Gurion, Golda Meir or Chaim Weizmann and the early Israeli leadership in the Mapai/Labor party. The party Begin founded, Likud, is far-right, whereas the original leadership were all left of center with backgrounds in the Labor movement. They were not, however, the left. The left blamed Mapai/Labor for rejecting the idea of a single Parliament for all of mandate Palestine with equal rights for everyone. The 1977 election was a dramatic shift right-ward for Israel which had till then been governed by a string of Labor-allied parties. Likud came to power in 1977, with Begin as Prime Minister. The same Begin who had been named a terrorist by Israel 30 years earlier. This statement advocates creating Palestinian “Bantustans” along the lines of those in apartheid-era South Africa. It envisages separate but unequal laws like those in the pre-Civil Rights American South. And this policy is the reality on the ground today. Palestinians live within borders demarcated by Israel. Their movement in and out of the country, between their own towns and between Gaza and the West Bank is controlled by the Israeli military who impose arbitrary rules. Palestinians in the West Bank live out their lives in a militarized police state, subject to arrest at any time without charge, surrounded by ever-expanding Jewish settlements built on their land. In Gaza, they live on a walled-in reservation. Everything and everyone going in or out passes through the border crossings that Israel controls (unless they use tunnels). The “solution” envisaged in Likud’s party platform is the Palestinian condition today. No wonder Likud has no interest in peace, only “quiet” that maintains the status quo. 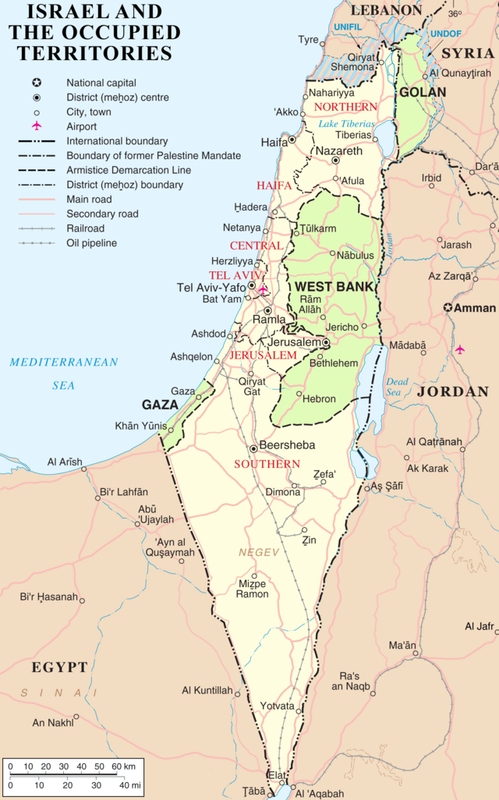 By 1977, Israel had held the occupied territories of the West Bank and Gaza for 10 years. Settlement building had begun almost immediately after the Six-Day War in 1967. The same pattern established in 1948 was repeated. Palestinians who fled the fighting were not permitted to return and numerous villages and homes were razed. Since 1967, Israel has effectively controlled Gaza, the West Bank and all aspects of Palestinian lives while paying lip-service to the “two state peace process”. As Mark Levine points out, the war of ‘67 began with a “pre-emptive” attack by Israel and ended with Israel holding the West Bank, Gaza, Sinai and the Golan Heights. When Begin came to power, he initiated a policy of expanding Jewish settlements in the occupied territories, particularly those with historic Biblical significance. That meant the West Bank. Or Judea and Samaria as the religious-minded base would call it. The settlements and the settler movement have continued to play an enormous role in Israeli policy ever since. They are in complete violation of international law, and official US policy. Large numbers of ordinary Israelis recognized their government had moved in a direction they did not entirely approve of. Hundreds of thousands protested in Israel during the 1982 Lebanon war. The This war was initiated by Menachem Begin and created lasting instability for the region and for Israel. The war is remembered for the intense Israeli bombing of Beirut which left many thousands of civilians dead (Reagan called it “a holocaust”). It is also justly remembered for the massacre at Sabra/Shatilla, in which perhaps as many as 3,000 Palestinian civilians were killed by Israeli-allied Lebanese Christian militia while Ariel Sharon’s forces guarded the exits to their refugee camp. An Israeli investigation found Sharon personally responsible for the massacre at Sabra/Shatila and he was forced to resign his post of Defense Minister. It’s remarkable that Ariel Sharon was elected Prime Minister, less than 20 years later. But Begin had set the precedent as had Yitzhak Shamir (who had been part of another rogue militia, the Stern Gang or Lehi). By the time Ariel Sharon ran for high office, much of Israel’s electorate was willing to ignore the odd massacre of Palestinians in a candidate’s past. When we hear about how much Israeli blood Palestinian leaders may have on their hands, we should perhaps remember this. The ‘82 Lebanese war should also be remembered for another event. The birth of Hezbollah. Hezbollah didn’t exist till after Sabra/Shatilla, they were formed by the same motivation that led to the creation of the IDF. Lebanese Shia concluded that no one else would protect them. Begin had always opposed the division of Palestine. He wanted an undivided Israel, a view that is shared by the far-right religious messianic camp within the Israeli population. Likud’s platform since the 90s has opposed a two state solution unless Palestinians defer security and other matters to Israel. You would not be wrong if you said Likud is committed to the destruction of an independent Palestine. Likud’s platform is a continuation of Begin’s dream of an undivided Israel from the Jordan to the sea, slightly modified to accommodate the inconvenient presence of 4.5 million Palestinians in the West Bank and Gaza by placing them in walled enclaves that are tightly controlled by Israel. Likud’s preferred solution would be to have these 4.5 million Palestinians removed from Israel, but failing that their aim is that Palestinians live in as small an area as possible, hemmed in by Jewish settlements. If you think this is preposterous, perhaps you should take a look at statements made by senior members of the Likud leadership. When we look at actual Israeli actions and their results, it is difficult to reach any other conclusion. So both in word and deed, successive Likud governments have been working to implement this plan every year they have held the reins of the Israeli state and the fate of the Palestinians in their hands. The Likud government’s views towards Palestinians, their rights and their lives has been painfully apparent during the ongoing bombing of Gaza. Three civilians have been killed by rockets in Israel (one of them was Thai). Meanwhile over 2,100 have perished in Gaza as of mid-August. Over 400 of the 2,100 were children, including babies a few weeks or months old. Estimates suggest maybe 200 or 400 of those killed may have been fighting for Hamas. Under Likud leadership, the Israeli Defense Forces have bombed numerous homes, killing entire families, at least 200 children have died in their homes as a direct result of these bombings. In some of these instances, IDF spokespeople have said they deliberately targeted a home due to the presence of a Hamas member. This was the case with a bombing that killed 6 members of the extended family of Henk Zanoli, a Dutch recipient of the “Righteous among the Nations” award for sheltering a Jewish boy from the Nazis. Mr. Zanoli returned the award after learning of the bombing. A visitor to their home on that day is said to have been a Hamas fighter. There are other incidents, a militant’s home was bombed killing him and his two sons (12 and 15 yrs old), 25 members of an extended family killed in an bombing to assassinate one Hamas member visiting the home, a failed assassination attempt against the head of Hamas’ military wing that left his 7-month old son, his wife, a middle-aged woman and her two teenage boys dead. There are many, many other such incidents. Israeli spokespersons claim these are legitimate targets suggesting “it’s just like Osama Bin Laden”. It bears remembering that in the strike against Bin-Laden, his children and wives were left alive, even though two of his wives were shielding him (one of them was shot in the leg). The IDF’s attacks are carried out using F-16s and missiles supplied by the US. Bombing the homes of combatants is illegal under the laws of war, especially when they are not engaged in combat and civilians are present. There is a good reason. If we apply that logic consistently, then every Israeli soldier or reservist’s home is a legitimate target at any time. Any workplace or public space an Israeli soldier or reservist is present in would be a legitimate target. Apart from bombing homes with families inside, the IDF have bombed UN facilities designated as shelters and used artillery to shell entire areas of towns in Gaza. All of which contravenes Israel’s legal obligations, violates treaties it is party to, and opens it up to prosecution for war crimes. This is being done to a people the state of Israel has a responsibility towards as an occupying power. A people who are living under the control of the Israeli state, in effective apartheid. The West Bank has not been bombed, but the 47 year old occupation has other forms there that are no less harmful. Israel maintains two sets of laws in the West Bank, one that governs Israeli residents and one that governs Palestinians. In almost all cases, Israelis are privileged. We can make a comparison with the Jim Crow era in the American south. Palestinians are discriminated against in much the same way as African-Americans were. Rules are unevenly applied to satisfy the far-right’s demands for land. Palestinian legal and political institutions have no control over important civil and criminal matters. 27,000 Palestinian homes have been destroyed in East Jerusalem. Israeli authorities do not grant construction permits to Palestinians. Palestinian families have routinely been evicted from their homes in Arab quarters of Jerusalem. In some cases, it is claimed that the homes they occupy had Jewish owners who fled East Jerusalem after 1948. Tellingly, there are many Israeli Jews living in East Jerusalem homes and on land that Arabs similarly fled in 1948 and 1967. None of them have ever been evicted in favor of the Arab owners. Israel provides its Jewish citizens with generous subsidies to move to the West Bank and has never halted or demolished an illegal Jewish settlement in the West Bank, even when they violate its own laws. Palestinians objecting to illegal construction on their lands are routinely arrested. Numerous unarmed Palestinian civilians have been shot and killed by IDF soldiers, many while protesting peacefully, including two 17 year olds in June. Investigations are often opened, and then closed quietly when the uproar has died down without any action . Settlement sponsors have repeatedly forged documents and manipulated land records. None of them are ever prosecuted. Israeli troops will defend any illegal Jewish settlement, even if it is a couple of mobile trailers placed on Palestinian lands in the middle of the night. Finally, Israel’s government never misses an opportunity to demolish the home of a Palestinian criminal. But in the 47 years of occupation, and as many years of violence by settlers and Israeli soldiers, no Israeli home has been demolished, not even those of notorious terrorists like Baruch Goldstein who killed 29 Palestinians at prayer in 1994 . This list in itself is only scraping the surface of the ways in which the Israeli bureaucracy is being consistently used to dispossess Palestinians in the West Bank. At first blush, Likud’s plans sounds deviously clever, a slow game of attrition to gain as much land as possible in an undivided Israel. You could even say it is what Ben-Gurion may have had at the back of his mind, and perhaps what every Zionist who landed in Palestine dreamed of. There is actually no deep strategic thinking behind this. These are only short-sighted tactics, they omit the broader strategic picture and fail to account for the impact it has on Israel itself. The fact is that Palestinians are not going to leave their land willingly, even in fear. They’ve learned the lesson of the Nakba. What 40,000 lightly armed militia managed to do in 1948 could not be done by ten times that number of heavily armed soldiers. It has an even worse impact on Israel itself. In the final reckoning, colonization has always corrupted colonizers and that sadly is happening to Israel. The license given to settlers to trample on even the limited rights of Palestinians is destroying the rule of law in Israel. This is why you see things like protests at Jewish-Muslim weddings, chants of “death to Arabs” at demonstrations, and increasingly violence against Arab citizens and residents within Israel. The far-right’s thirst for land in the West Bank has had a toxic effect on Israeli civil society. Israeli tactics meant to claim as much of the West Bank and Gaza as possible are a poisoned chalice. They are destroying Israeli democracy and will eventually result in Israel being branded a pariah state along the lines of apartheid South Africa. Quite apart from this consequence, the Israeli state’s policies towards the Palestinians are deeply unjust and in most cases illegal under International laws of occupation and treaties to which Israel is a signatory. And what is gained from all this? The West Bank? Appeasement of the far right base which has deeply held religious view on the status of the West Bank, what they would call Judea and Samaria? Annexing the West Bank and Gaza without granting Palestinians equal rights would not be the action of a democratic nation that wishes to achieve true security. True security for Israel can only come from a just peace with the Palestinians and subsequently with the countries around Israel-Palestine. It only makes sense if Likud were not interested in maintaining a democratic state, at least in the manner we are accustomed. Incorporating the 3 million Palestinians who live in the West Bank is delicately referred to as a “demographic problem” (and this does not begin to tackle the rights of the Palestinians who fled to Jordan or other countries and wish to return). If Israel were to grant Palestinians equal rights, the Jewish population would find itself holding a razor thin majority in a few years. If Gaza were annexed, the Jewish population would be a minority in short order. It is also possible Likud does not wish to attain true security. You will often hear Israeli spokespeople talk about how the 1948 or 1967 borders are indefensible. The truth is, Israel will never have strategic depth in the manner that the US and Russia have. The river Jordan is 50 miles from Tel Aviv. Those 50 miles do not contain nearly as many defensive positions or mountain ranges to fall back on as there are between Moscow and Vladivostok or DC and Omaha. The alternative is the status-quo. Israel maintains the fiction that the West Bank and Gaza are not part of Israel and remain independent. But neither territory has control of its borders and Israel limits the free movement of people and goods under security pretexts. Likud continues to permit more Jewish settlements in the West Bank. This scenario does not end well for the Israeli people either. The Palestinians will continue to chafe against the unjust restrictions. As we are seeing already, the label of apartheid will be applied more often to Israeli policy. In the US, we will likely come to the realization that Likud’s policies are not unlike South African apartheid, or our own history of Jim Crow legislation. Eventually this will lead to a loss of support and sanctions. Needless to say, Benjamin Netanyahu is no David Ben-Gurion or Golda Meir. And Ben-Gurion himself is not the mythical, peace-loving avuncular figure who looms large in the imagination of many. Ben-Gurion is justly remembered for stressing military action and his single-minded pursuit of nuclear weapons. Recall that he said the partition of Palestine was just the beginning, a foot hold, and that Jews would eventually settle all of Palestine. It’s pretty clear that “other means” were used. Israel has fought four wars of aggression, most for territory. 1948 (conquered 70% of Palestine, as opposed to 50% in the partition plan and under 10% held previously), 1957 (conquered Sinai and the Suez Canal with British and French forces), 1967 (a sneak attack/pre-emptive strike to conquer the West Bank, Gaza, and the Golan Heights). The fourth war, the Lebanese war of 1982 was distinguished by the brutality of Israeli forces and their allies in both the bombings of Beirut and the massacre at Sabra and Shatilla . Massacres of hundreds of civilians had been committed by the IDF in 1957 as well. This history, the shift rightwards in Israeli politics and uninterrupted settlement building in the West Bank have gravely compromised any hope for a two state solution. No reasonable person can hope that Likud under its current leadership will work to achieve a just peace. How can then, when the coalition can’t or won’t remove a single mobile trailer illegally placed on a Palestinian farmer’s land under cover of night in the West Bank? To outside observers, it increasingly looks like the Israeli state has lost control of the settler movement. The rule of law in the West Bank is virtually non-existent. In a sense, this was inevitable given the system of separate laws for Palestinians and Israelis (much like Jim Crow in the US south) and the fact that Israeli soldiers (often young conscripts) are enforcing these unequal laws. Jewish settlers in the West Bank have become a law unto themselves. Their sympathizers in Israel’s government, bureaucratic and security apparatus assist them in circumventing Israel’s own laws and Israel’s obligations under international treaties. When an incident of settler violence or land-theft is deemed too blatant, an investigation is launched. Years later, it is silently closed without action. IDF operating procedures in both Gaza and the West Bank are increasingly running counter to the laws governing war and occupation. Israeli soldiers routinely shoot at unarmed civilians protesters, or civilians approaching their positions. Numerous investigations are opened, and then silently closed years later. Soldiers who force a 9 year old Palestinian boy, at gun-point, to open packages suspected of containing bombs are given suspended sentences and demoted a rank. A democracy without the rule of law and protection for all humans under its control is just mob-rule. Impunity for violence against Palestinians, impunity for the theft of their lands, and state sponsored actions to destroy their property are an everyday occurrence. The consistent abrogation of Palestinian’s human rights has turned Israeli democracy into a form of mob-rule. In Israel, the result is that large segments of Israeli society have de-humanized Palestinians. Internationally, there is increasing skepticism that the Israeli state’s goals are not entirely as presented. This is why you see literally thousands of posts on social media calling for the entire destruction of Gaza and its population. This is why the websites of human rights organizations have been attacked during the crisis, and the same organizations are denied access to Gaza. It is why the attitude of ordinary Israelis towards Palestinians in their midst has become coarser and coarser throughout the occupation. There are many affinities between the USA and Israel. In one sense, there is a parallel between the story of their founding. In each case, a determined group of founders escape religious persecution in Europe to found a nation. In both cases there is a myth that the land was lightly peopled when the truth cannot be more different. Each nation has been belligerent and wrested lands from neighbors using settlements and the security of its citizens as a pretext (the US from Mexico mostly). Both nations have persecuted the native population and attempted to place them in reservations and restrict their movements. Both nations imposed an unequal, discriminatory laws on a segment of their population. In the end though, the discordance between the American idea that “all men are created equal”, and the reality of slavery became too much to bear and the Civil War came. When a 100 years after the Civil War, it was clear that the laws of the land were still not being applied equally to all, the just force of the Civil Rights movement helped correct that. Israel and Israelis are at a similar cross-roads today. If their nation is to stay true to the ideals of its founding, the ideals of the Jewish faith and the universal rights of humans, then Palestinians must have equal rights and the two communities must learn to live together in peace. There are many who recognize this and it is they we must support, not the voices that feed fear and hate. This is part of the reason the Civil Rights movement resonated so strongly with the Jewish community. They had personal experience with discrimination, in both America and Europe. A strong commitment to social justice on the Jewish left was a significant factor as well. Incidentally, Begin claimed that British authorities had been warned of the bombing ahead of time via a phone call. This is reminiscent of the current Israeli claims that phone calls to individuals legitimize later bombings of their homes. Jewish communities in the rest of the Arab world migrated en-masse to Israel in large numbers after 1948. Many undoubtedly came to Israel due to fears similar to those that drove the Palestinians. But most had not been affected by Nazi horrors in the same way that European Jews were, and some went to Israel for the incentives offered to move. Palestinians cannot legally own private firearms whereas Jewish settlers do. There have been numerous cases of Jewish settlers shooting unarmed Palestinians. Two homes were demolished by the Israeli Army in August, they belonged to men suspected of participating in the murders of Gil-Ad Shaer, Naftali Fraenkel and Eyal Yifrah, the three teenagers kidnapped and shot dead in the West Bank in June. There is no word on whether the Israeli Army will also demolish the homes of the Israelis suspected of kidnapping 14-year old Mohammed Khdeir, bludgeoned him, poured gasoline over him and set him alight while alive. Osama Bin-Laden said the images of dead women and children from the bombing of Beirut had convinced many of his compatriots that attacks on Western civilians were justified.